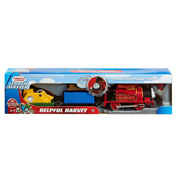 Thomas the Tank and the engines from the hit television show spring into life in this range of expandable toy train sets. 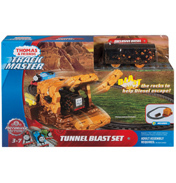 The Trackmaster system offers endless amounts of fun with the buildable track pieces and wide range of add-on accessories. 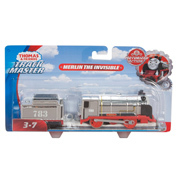 Children aren’t fixed to creating one dull layout with the Trackmaster system. 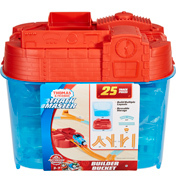 They can build and adapt it any way they wish, which means it sparks creativity, invention and helps to develop their hand-eye coordination. 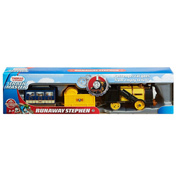 All the trains within these sets have two modes of play, push along or motorised. With the simple switch they can easily be turned from one to the other, and if the batteries run out, the fun can just keep on rolling! 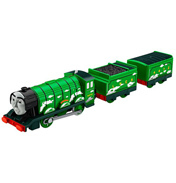 One of the favourites is the Tidmouth Sheds Playset. 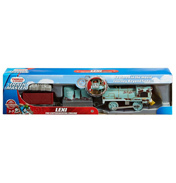 This not only has an oval track, four bays to fit your favourite engines but a working turntable too, just like on the TV show! 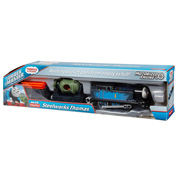 When Thomas or another train rolls onto it, it will automatically begin to turn – just flick the lever when you want it to stop. 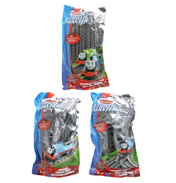 A great extra for any growing Trackmaster set would have to be an Action Destination section. 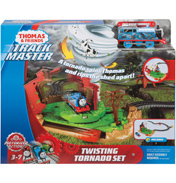 Each one will transform a simple straight section of track into a fun adventure. For example, the bridge section will remain open until a train comes near, it will then automatically close to let the engine pass and then spring back open again! 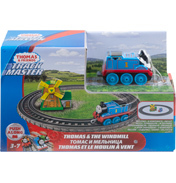 The action literally never stops with Thomas and his friends on the Trackmaster system. Join in the fun and see where your imagination takes you!